UDPS is an Institution for social and financial services. It as a national NGO, has been working in implementing different humanitarian social development projects and microcredit programs in 21 districts with 100 branch offices including project office across the country for the last 31 years for socio-economic development of the rural and urban poor specially women and children having its head office in Dhaka and six zonal office`s encompassing more than 534,415 (Microcredit-270,815 + Project-263,640) beneficiaries during the year. It has also been providing financial assistance from microcredit programs to bring the poor people out of extreme poverty and change their lifestyle making them self-reliant. It was established and founded by Mr. AFM Akhter Uddin, founder and Chief Executive of UDPS in Salandar under Sadar Upazila of Thakurgaon district on September 1, 1986. A total of 675 (Microfinance-502 + Project-173) and 187 female (Microfinance-57 + Project-130) skilled and dedicated employees are employed with UDPS to implement all kinds of projects including imparting training, formal and non-formal education, humanitarian socio-economic development project, awareness building on social issues, community mobilization, disaster management, women and child development, raising awareness for adaptation of climate change, food security and livelihood and microcredit programs. The vision of UDPS is to build Bangladesh through socio-economic development and sustainable cultural status, environment friendly, based on justice, free from exploitation and discrimination. Consequently, the institution will be working relentlessly for the improvement of lifestyle of the poor, marginalized farmers and the people lagging behind in the society through socio-economic development. Socio-economic development of rural and urban poor of men and women, adolescent, children, disabled, unemployed youth and disaster affected mass people through an extensive and intensive participatory development process. UDPS has been registered with the following registration authorities of the Government of the People’s Republic of Bangladesh ensuring its legal status: 01. NGO Affairs Bureau, 02. Microcredit Regulatory Authority (MRA), 03. Joint Stock Companies & Firms, 04. Directorate of Social Welfare Department, 05. TIN Registration, Commissioner of Taxes, Taxes Circle-51, Taxes Zone-5, Dhaka, 06. VAT Registration, Asstt.Commissioner of Customs, Excise and VAT, Mohammadpur Division, Dhaka. UDPS has been implementing its program activities by its skilled, well-trained and dedicated staff. Total staff: 862 (Male: 675 + Female: 187) including projects. UDPS target people and beneficiaries are from rural, urban, cities slums and char areas who are poor, helpless, lagged behind people, marginal farmers and micro-entrepreneurs especially poor women. Total members: 65,644, Loan beneficiaries: 54,163 (Male: 0 + Female: 54,163), Project beneficiaries: 52,728 poor households. As part of various community development activities, UDPS has been maintaining memberships of the following international and national organizations as network partners. The aim and objectives of networking are to collectively address local development challenges including sharing of information and technology regarding development initiatives within the country and at the international arena. To ensure sustainable development and good governance of the organization, UDPS has 2 Committees- one is General Committee (GC) and other is Executive Committee (EC). The General Committee consists of 15 members while the Executive Committee consists of 7 members. The members of GC and EC Committee usually drawn from the civil society with diversified professional and NGO backgrounds. The duration of their membership is for 3 years and after expiry new members are inducted and nominated to replace them. The duration of the Executive Committee is for 3 years and required to renew from the Joint Stock Companies & Firms in every 3 years interval. The General Committee meeting usually held once in a year while the Executive Committee meeting held at least 4 times in a year for smooth management of the program activities and to discuss the ways and means for good governance of the Institution. The annual meeting of the general committee (AGM) was held on 30 December, 2016 at Uttara Training Institute (UTI), South Malatinagar, Bogra and formed the executive committee for the next three years from 17.01.2017 to 16.01.2020. The members of the Executive Committee take the decision for planning, management of the program activities and help the Chief Executive to discharge his day to day responsibilities. Considering the importance of saving money for future use and investment, UDPS inspires its members to form savings fund through depositing savings with a view to grow saving habits. It has been maintaining 3 saving accounts for the welfare of its members – (1) General savings, (2) Voluntary savings and (3) UDPS monthly savings project. UDPS gives 6% profit on annual basis to the members against their savings. As on 30th June 2016, total saving stands at Taka 34,14,97,588/- received from 53,674 members. Microcredit has been regarded as the main program of UDPS to provide major field based economic development activities as per its strategy. Economic development activities mainly focus on poverty reduction, increased food security, capacity enhancement of vulnerable groups and scaling up informal economy. It’s future direction will be both horizontal and vertical expansion by offering demand driven new products. Currently , microcredit program is operated in 103 upazilas of 21 districts covering 2549 villages through its 91 branches and serving 65,644 members of 4545 groups. Microcredit is provided to the members/clients based on various components. A total of 1754.67 crore taka has been disbursed so far and total outstanding raises 124.46 crore taka as on June, 2017. Pathways from Poverty: Building Economic Empowerment & Resilience for extreme poor households in riverine areas of Bangladesh (PFP) Phase-II project. Echo funded Flood Recovery Project- Sirajgonj supported by Concern Worldwide- Bangladesh. Uttara Public School was established in the year 2004 in Bogra Town for the development of education. It has been running and financing with UDPS own fund. Presently, students are taught from Play to Class-III in the school. Total number of students in the reporting year is 86(female-33 and male-51), admitted during the year 51. A total of 41 students passed in the final examination and out of that, 15 students got scholarship ( talent pool-5, A grade scholarship-7 and ordinary scholarship-3). The students promoted to class 1V got admission into Government Primary Schools in the area. There are 08 teachers and one support staff . Along side the formal education, extra curriculum activities such as song, dance, drawing, recitation, indoor games and physical exercise are included in the curriculum. There are development plans in future to transform the school into a high school in phases from year to year. UDPS has established the “Uttara Agriculture Institute, Bogra” at Ranirhat, PS. Shajahanpur, Bogra on 1.72 acres of land with a view to contribute diploma degree holders on agriculture and fishery sector with its own fund. Presently, the Institute has been conducting 4 years Diploma Course in Agriculture. Modern technologies for boosting agriculture production are included in the course curriculum. The Institute has a large vacant land in the campus for using as demonstration field and practical activities in agriculture. A total of 53(11 female and 42 male) students have been continuing their Diploma in Agriculture in 3 batches and 19 students passed in the final diploma examination. Up to June, 2017 a total of 55 students have successfully passed the final examination and got diploma degree. There are five teachers and four staffs (Accounts officer 1+ support staff 3). Admissions are going on for 1st year Diploma in Agriculture and so far 14 students has been admitted during the reporting year. The Institute has already got approval from Bangladesh Technical Education Board (BTEB) for 4 years Diploma Course in Fish Culture and planned to start admission soon. The management of the Institute has a future plan to upgrade the Institute into Agriculture College for offering degree courses. For any query, may contact the Principal, Mr.A.Q.M.Abdus Sobhan, Mob:01718615066. 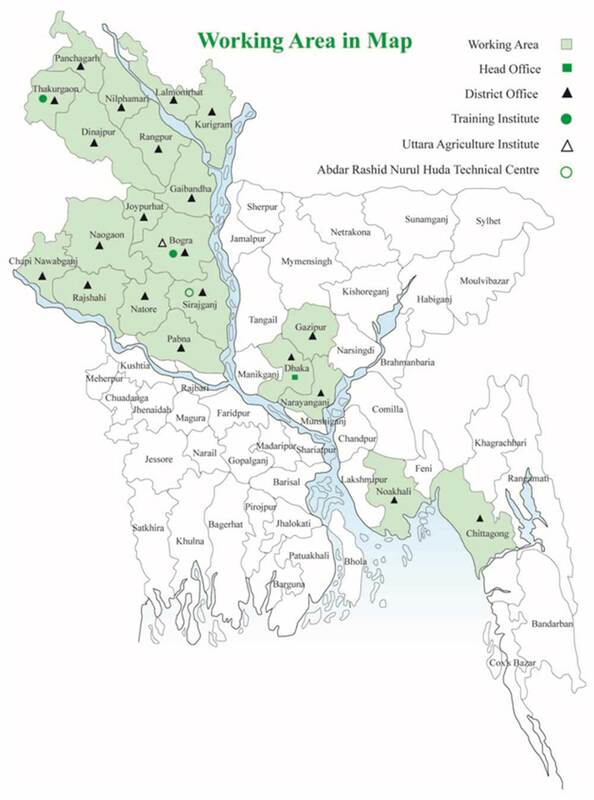 UDPS has established Abdar Rashid Nurul Huda Technical Education Center at Rupshi, Enayetpur under sirazgonj district. This centre has got approval from Bangladesh Technical Education Board, Dhaka. The center has been conducting four trades namely a) Electrical and house wiring, b) Plumbing and pipe fittings, c) Dress making and tailoring and d) Mobile phone servicing on 3/6 months duration.